This is the third post in the Tribute to Ronald Johnson, each of the first three segments devoted to one of three sections of the poem 'Three Paintings By Arthur Dove' from Johnson's first collection of poems, A Line of Poetry, A Row of Trees [Jargon Press, Jonathan Williams, Highlands, North Carolina, 1964]. what our memory assures us to be fluid & moving'. & there are rings of growth & brightness. Johnson is a classic unitive visionary. That is, a writer/thinker who saw connections everywhere. A pond reflects the sky, through which clouds move, masking deep space, neither more nor less "infinite" than the space between the molecules of water which float in their own specific gravitational stasis. Is the reflection of the sky less real than the events which we can't see "with the naked eye"? Johnson incorporates scientific fact and discovery into the poet's insights, producing symphonic movements of phenomena, flowing, intertwining--as demonstrations of the interconnectedness of the universe. The reference in the first stanza is to Albert Pinkham Ryder (1847-1917), an American painter of poetic landscapes. His work is not unlike that of earlier figures such as Blake, or Samuel Palmer--it suggests sweeping, lyrical torsions and fields of cyclic interaction. The reproduction on the upper left is of his painting The Flying Dutchman . The reproduction on the right is Arthur Dove's painting Moon, the subject of this poem. The title in the third stanza--Ferry Boat Wreck--Oyster Bay--is the title of another canvas of Dove's, regarded by some as his best. Dove was an early Modernist, one of the first to explore the visionary potentials of imagery verging on, but not quite capitulating to, total abstraction; he is known to have profoundly influenced the work, for instance, of Georgia O'Keeffe. What Johnson sees, he also hears. 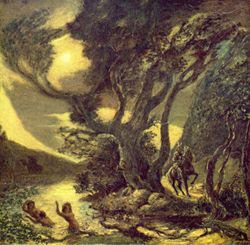 The moon in the painting appears almost to grow out of the trunk of a tree; its stark illumination suggests vibration to Johnson, a resonant planetary tone. Dove sought to capture the essential forms of nature, to extract the dominant formal and metaphysical qualities from objects and scenes. These "extractions" as he called them were meant to portray irreducible principles, keys to other dimensions, visible only to the spiritually awakened eye, the enlightened mind. Their power lay in their intensity, of the unflinching concentration upon transcendent light. As Johnson says, they were "new form, 'boundaries of other/events'" or the interface or friction between dimensions of being or forms (states) of matter--which Johnson then compares to the tree-rings of the sequoia, the layers of agate--returning then, to his theme of relativity of scale and the complementary illusions of stillness and flux. In the first section of the poem, we are reminded that he had said "If we could look at an orange flower long enough//it would become blue." This is mirrored in the third to last stanza of section III: "At the heart of this/light/it is dark." The visionary is afforded an interior view of phenomena, one that permits him to perceive obverses, to resolve apparent disequilibriums, and to look through the layers of the onion to the core of meaning. The visionary tradition in America poetry is not particularly strong. Allen Ginsberg often fancied himself a visionary poet, but his insights rarely rise beyond the level of comic-book parody. Johnson is interesting in the way he unites the democratic vistas of Whitman, with a metaphysical apprehension of landscape. He doesn't merely accept the imagists' delight in the well-described object, but looks into, and through, and beyond it. Like Oppen, he perceives "another reality" beyond "the things of this world" and celebrates raw experience as the evidence of transcendence (Emerson). Rather than "imaginary gardens with real toads" in them, he posits real gardens with real toads! His poems aren't decorative, but exploratory, in the same manner that a horticulturalist's, or a botanist's, or astronomer's, or particle physicist's researches are. Poetry is not a parlor-game for Johnson, but a noble calling. We shall have more to say about his work in future posts. Very nice essay-post. I have a little Arthur Dove story. I was on business years ago on Long Island, and at the end of the day, I left my hotel for a run. As I was coming back to the motel, I noticed there was a little cottage on a small pond behind the motel. As I approached the cottage I saw there was plaque nearby. It said: Arthur Dove (American artist) spent many summers here doing his paintings. (Really rough paraphrase.) It was my first introduction to the artist Arthur Dove, but I went straightaway to a library and checked out a few artbooks. Some say he is the founder of abstract painting, as much as it can be traced back to any one person. Ginsberg's credentials are well established, and don't need any amplification by me. I also think it's well established that his work doesn't rise to the level of complexity that we ordinarily associate with poets of the first rank. Prosodically, I find his best poems impressive, but their evident thought and content are usually not. Not a profound thinker. Johnson's little three-part poem I've been studying is more interesting than 98% of Ginsberg's poems, for my money. Ginsberg isn't a Language Poet; he generally means precisely what he says, and what he says is usually straightforward and uncomplicated. These are good things. thanks curtis, for taking the time to look closely at this poem and for posting the process. having now read all three posts on johnson's poem i find it (the poem) is more interesting than it may otherwise have appeared, even though,its beauty, mystery would (does) stand alone and say that for itself.